Collaborative robot market is anticipated to exhibit fast-paced growth during the forecast period 2018-2023. In the recent years, there have been several new product launches in the market, and a collaborative robot market has undergone a paradigm shift on the technological aspect. Furthermore, the prices of collaborative robots have also declined substantially which have resulted in a quick return on investment and cost-effective performance of these robots. The demand for collaborative robots across several industries has witnessed a significant rise in the recent years, and the trend is anticipated to continue in the next few years, owing to their high accuracy and declining cost. The rising number of industries moving to automation across emerging nations and robotic application gaining traction is expected to open several new opportunities for the collaborative robot market in the years to come. The major industries where collaborative robots are used include includes automotive, electrical, electronics & semiconductor, plastics & polymers, pharma & chemistry, food & beverage, aerospace & defense, metal & machining, others, among others. Major applications where collaborative robots are used include material handling, small parts assembly, CNC machine tending, molding operations, test & inspection, gluing, dispensing, welding, packaging & palletizing, screw driving, and polishing, among others. • This report identifies the collaborative robot market in different segments such as industry, application, and geography. • The study includes the market analysis and forecast of the global collaborative robot market from 2018 to 2023 in terms of value. The report also highlights the year-on-year growth of the market. • The study talks about the prime supply-side factors affecting the growth of the market along with the current and future trends in the collaborative robot market. 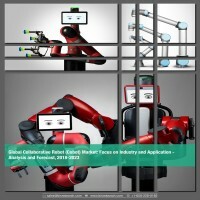 • The study also presents a detailed examination of the collaborative robot market along the lines of market drivers, restraints, growth opportunities, and challenges. • The study provides a detailed analysis of industry attractiveness through Porter’s Five Forces analysis. • The report also highlights the value chain of the overall collaborative robot industry. • Detailed competitive analysis has been included in this report which focuses on the key developments & strategies, followed by the players, in the market. Additionally, analysis of their position in the market is also provided. • The report also provides a detailed study of different industries in which collaborative robot is being used, such as automotive, electrical, electronics & semiconductor, plastics & polymers, pharma & chemistry, food & beverage, aerospace & defense, metal & machining, and others. • In this report, various applications of collaborative robot market have also been studied. The applications include material handling, small parts assembly, CNC machine tending, molding operations, test & inspection, gluing, dispensing, welding, packaging & palletizing, screw driving, polishing, and others. • The collaborative robot market has been analyzed for all the geographies including North America, Europe, Asia-Pacific, and Rest-of-the-World and further analysis with respect to several major countries. • The key market players are analyzed and profiled in detail in the Company Profiles section of the report. This section covers the business financials, company snapshots, key products & services, major developments, and finally, the individual SWOT analysis. Figure 8.36 SWOT Analysis – NACHI-FUJIKOSHI CORP. Figure 8.38 SWOT Analysis –Precise Automation, Inc. In the mid of 20th century, when the industrial revolution started, there was a rise in the requirement of tremendous work which fueled the need to employ robots alongside humans to perform tedious and repetitive applications with precision and accuracy. The automotive industry was among the early adopters of industrial robots owing to the demand of large parts assembly and several other applications. In 1961, General Motors, an automobile manufacturer, installed the first prototype of the industrial robots, named Unimate. This resulted in increased efficiency of the work process and the decline in the overall cost. Fast forward to 2008, when, Universal Robots A/S, the leading collaborative robot manufacturer launched its first collaborative robot. After that, the collaborative robots have gained a lot of popularity across various industries, and they have been employed to perform an array of tasks. Collaborative robots are used in industries to perform applications, such as assembly, pick & place, packaging & palletizing, machine tending, screw driving, among others. Some of the features, such as the capability to be used alongside humans, easy installation & operation, and lower cost when compared with conventional industrial robots, set the collaborative robots apart from the traditional robot. With all these additional benefits, collaborative robots also provide enhanced process efficiency and unmatched cost reduction. Therefore, the demand for collaborative robots has shot up, especially in the last decade. In the past two to three years the industry has witnessed several new product launches from traditional industrial robot manufacturers. These product launches underline a clear shift undergoing in the robotics industry where collaborative robots are emerging as the next big thing. The demand for collaborative robots is rapidly increasing among different industries across the globe. The market is driven by a number of factors, such as growing market penetration of collaborative robots across multiple applications, increased productivity at the workplace, declining prices & quick return on investment, and minimal infrastructure, and flexible operation of collaborative robots, among others. In 2017, Automotive industry in the collaborative robot market accounted for the maximum share in the overall revenue. The significant share of the automotive industry is mainly attributed to a large number of repetitive and tedious tasks present in the industry for which the companies are employing collaborative robots to increase the cost-effectiveness of the processes. Europe, followed by Asia-Pacific, North America, and Rest-of-the-World, is expected to dominate the market during the forecast period. However, in terms of countries, the United States is the leading country in the collaborative robot market, and the country is expected to maintain its dominance during the forecast period. The country has the presence of collaborative robot manufacturers in the country. Asia-Pacific is expected to grow at the highest CAGR with China dominating the market in this region. Some of the key players in the collaborative robot market include: Universal Robots A/S, Rethink Robotics, Fanuc Corporation, KUKA AG, ABB Robotics, Aubo Robotics, Bosch Rexroth AG, Denso Corporation, and Yaskawa Electric Corp. among others.